CUESA is excited to welcome two new local meat vendors to the Saturday Ferry Plaza Farmers Market, ranchers with a passion for their animals and the land. Last week we introduced you to the grass-fed beef and lamb farmers at Stemple Creek Ranch. This week, meet the poultry producers at Chowdown Farm. From partridge to lamb, distinct and delicious flavors are always in rotation at Chowdown Farm. It’s no wonder that Brian Douglass, a trained chef and fifth-generation farmer, and Kristy Lyn Levings, a third-generation farmer, met on a tasting panel at the Woodland Tomato Festival, where they discovered their mutual passion for cooking and farming. They fell in love and decided to start farming together. 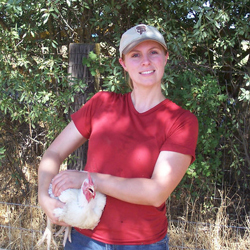 In 2009, they rehabilitated a few acres that had belonged to Brian’s family outside of Woodland, near Cache Creek, beginning their lives as “premium pasture-raised poultry producers,” as Kristy puts it. Chicken became their gateway to a multispecies menagerie. Chowdown now offers chicken year-round and lamb in the spring and fall, with small quantities of other meats—quail, pheasant, chukar partridge, guinea fowl, duck, and rabbit—once or twice monthly at their farmers market stands. Kristy and Brian see poultry on a continuum of light to rich flavor: chicken on one end and duck on the other, with partridge, guinea fowl, and quail falling in between. Even Chowdown’s chicken breeds, which they worked with a local hatchery to develop, have their nuances. The short and squat L’Argent is strongly flavored with a nice fat layer, while the Buccaneer is a longer-bodied chicken with a crispy skin and yellow fat. The Dorper sheep, originally from South Africa, is another unusual animal breed that Chowdown has turned their customers on to. “People often have a negative reaction to lamb because of the lanolin from the wool,” says Kristy. Lanolin is a waxy substance secreted in the skin of wool-bearing sheep, which is believed to impart a musky scent and taste to lamb. Because Dorpers are hair sheep (meaning they have hair instead of wool), the meat has a cleaner, milder flavor. 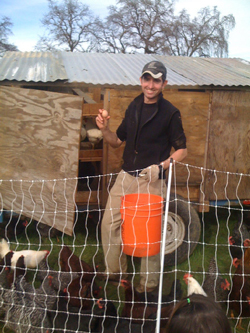 Birds are raised in spacious pasture “schooners” (enormous open-air and open-floor chicken hutches), and the diverse pasture mix is supplemented with grains and seeds from a local feed mill. The couple tends to the 35-acre operation by themselves, with Brian handling most of the farm management and Kristy the sales, in addition to her off-farm administrative work. Raising capital and finding enough time in the day to do it all are their biggest challenges as small farmers. “Farming is an incredible amount of hours, working for less than minimum wage,” says Brian. Chowdown Farm and Stemple Creek Ranch are now at the Ferry Plaza Farmers Market (back plaza) on Saturdays. Photos courtesy of Chowdown Farm.